It is a requirement of your Agreement, that the goods are protected against Theft and Accidental Damage. We can arrange Theft & Accidental Damage Cover for £1.76 per week. It is a requirement that products purchased on a credit agreement are insured. We can offer Theft and Accidental Damage Cover for £1.76 per week. Delivery Please ensure the appliance will fit into the space and that there is a suitable electric connection within 1.5 metres, Drivers are only able to deliver to the ground floor due to health and safety issues. If you have steps to your property, please choose an alternative item. 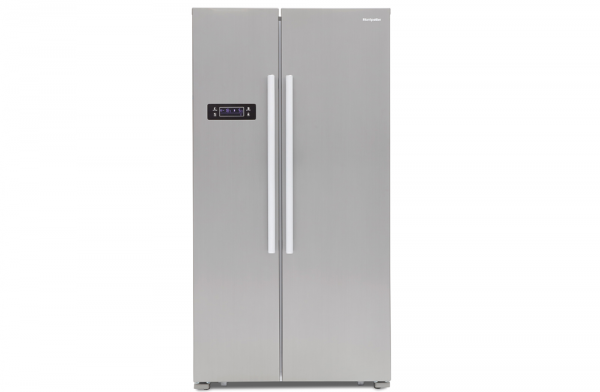 This Montpellier American Style Fridge Freezer is perfect for the larger households or for a large appliance themed kitchen. What good about this large fridge freezer is that you can adjust the shelves, draws and storage so that its perfect for you. The quick freeze function is great for quickly freezing any new foods that have been added and the no frost function maintains an even temperature throughout, so there won't be a build up of ice. In the attempt to save you money and energy, when the doors aren't closed correctly, and alarm triggers and beeps to let you know. This Fridge Freezer also offers a digital touch control panel allowing you to select the setting you want quickly and easily. Don't worry as another feature of this fridge is a child lock. Delivery: Please ensure the appliance will fit into the space and that there is a suitable electric connection within 1.5 metres, Drivers are only able to deliver to the ground floor due to health and safety issues. If you have steps to your property, please choose an alternative item.